PIM synchronization on mobile phones is a popular option of backing up important personal data, such as phonebooks, contacts, emails, calendar and events and so on. PIM is an acronym for the “Personal Information Manager”, the well-developed protocol of automated exchange for personal data. PIM is a part of a mobile device software. It works often through the USB or Bluetooth connection between the selected PC and the mobile unit. It is possible that some PIM sync software will also utilize WiFi to speed up wireless data exchange. The main advantage of PIM is that all personal data are viewed as parts of some whole logical object. Users can select and backup essential components of PIM without a need to decrypt an internal file system structure of their mobile devices, saving only data they are really need to save. This strength reviews also the weakness of this technique. User has as much control over his or her own data the PIM sync software provides, and cannot back up any data from the mobile unit outside the PIM-oriented information when connected to a PC. PIM backup can also be somewhat sluggish. These are many PIM-oriented backup solutions, using the mobile phone personal dataset as the logical object to back it up fully or partly. While most brand mobile units have their own PIM managers, some unified software for Windows and Android also exist, such as EssentialPIM Pro and other. Handy Backup has no support for PIM, as this solution works on a much more unified level than PIM data managers do. Using Handy Backup, you can synchronize not only personal data but also photos, music, browser information (see Google Chrome backup), books, offline pages and anything other from your mobile device! To sync up your mobile data with your PC, please plug in your mobile phone to some USB port on your computer and create a new synchronizing task according to the User Manual. 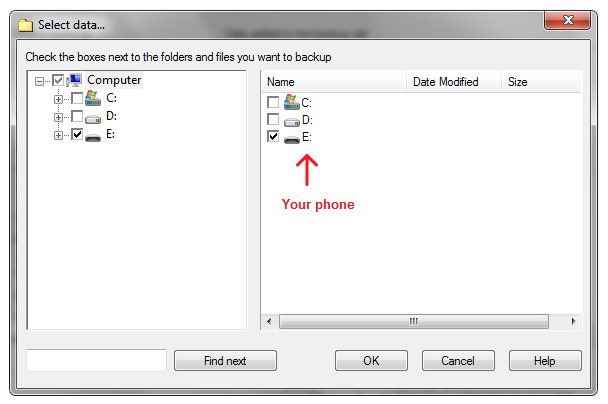 Select your mobile device as the external drive (first folder), and do all steps as described in the instruction. Of course, Handy Backup has a capability to back up and restore any data governed by PIM protocol; just select these components as files or folders, not as parts of a PIM dataset. An additional advantage is that Handy Backup preserves original data formats, allowing opening and use these files freely.